an excellent choice for the vinyl enthusiast. 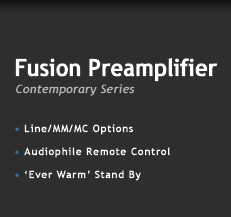 Preamplifier being a high-end audiophile component. noise, high gain tube preamplifier stage. separate volume control on a CD player. a low noise fully screened stiff toroidal power transformer. with the tube MM stage. volume control on a CD player. a free standing structure with integral isolation rack.